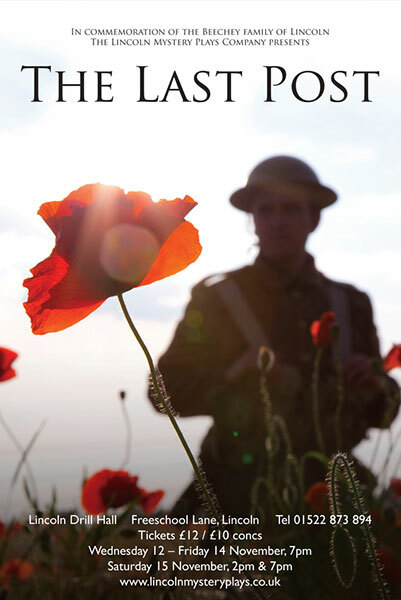 In November 2014, to commemorate the centenary of the outbreak of World War One, the Lincoln Mystery Plays Company performed a new work, The Last Post, written in tribute to the Beechey family of Lincoln. This community play was written by two local residents, David Owen Smith and Peter Came. The eight Beechey brothers all enlisted to fight in the Great War and their journeys took them from training camps in England and Australia to Gallipoli, East Africa and the Somme in France; five of the brothers never came home. The play was inspired and based on the 300 letters the brothers had written to their mother, Amy, and their sisters at the family home, 14 Avondale Street, Lincoln. As well as following the Beechey brothers’ individual stories, the play recreated the community of Lincoln during those times. With a company ranging in ages from 8 to 80 playing over 70 named characters, costumed by Ba Wheeler with additional uniforms loaned by John Naylor from Echoes of a Gilded Age, and a beautifully crafted set designed by Giuseppe and Emma Belli, this was a unique production, the like of which had not been seen before at the Drill Hall. The show also featured a choir, and uniformed musicians from the Band and Drums of the Lincolnshire Army Cadet Force. Hats for the production were made by members of the Gemini Project, an NHS therapeutic arts engagement project. The Gemini project also mounted a display in the foyer of the Drill Hall of WW1-inspired hats. With its local WW1 story, its site specific nature and its timely performances in Armistice week, the community nature of The Last Post invoked the spirit of the wartime ethos and very clearly moved those who came to see it. Never before had our actors played to sell-out audiences at every performance, and never before had the company witnessed the heartfelt standing ovations at every performance. This was a production that established the Mystery Plays Company firmly at the heart of Lincoln culture. from Mrs Joey Warren, granddaughter of Amy Beechey. The Last Post was performed at the very place where the Lincolnshire Regiment was drilled in readiness for war – Lincoln’s Drill Hall – during Armistice Week, November 11 – 15, 2014. One word can describe my feelings on The Last Post – Community! The Lincoln Mystery Plays Trust is a community theatre company that creates and performs plays for our community, specifically the mystery plays, first performed by the community in medieval times. The Last Post is about a local family, our neighbours, albeit from a different era. The Beechey family walked the same streets as we do in Lincoln today and they helped to shape the city, as each one of us does. When I reflect on how this production has grown and how it has brought together so many people from different walks of life, all wanting to make their own contribution, I find it very moving. How is it that members of our community – builders, scaffolders, teachers, children, students, members of the armed forces, business men and women, workers from all trades and professions and retired people have come together to make this production? Simply, because they care enough to want to make their own contribution at this poignant time of remembrance. Each of us has our own connection to the Great War – an ancestor, a loved one, a memory, a story to tell – and this is the time to tell it. What an amazing thing to happen – a collective remembrance at this very special time and in this very special setting, the Drill Hall. There is so much that is special about The Last Post. It is a story of a family whose sacrifice was unique and it is a commemorative remembrance of their courage, together with all those other people who went through the unimaginable suffering created by the Great War. I warmly welcome and invite you, our audience, to share this experience with us and complete the circle of community.